Sock number one, done. Worn by me on the left; guest modeled by Nine on the right, showing the way the stripe changed just as I was grafting the toe. Did as I’ve been told, and cast on for the second sock right away. If the first one was a summer sock, the second will be a fall baby. The light is changing, flattering sock and garden alike. This plant got more queries than any other last Saturday when the garden was open. 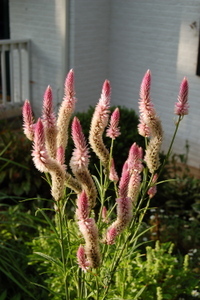 It’s pink spiked celosia (a form of Celosia cristata) that I originally got from Monticello and which now seeds itself throughout the garden. I’m not a huge fan of pastely pink in my garden – it washes out in our summer sun – but this time of year, it looks pretty good. Another sign of fall: soccer games started today. 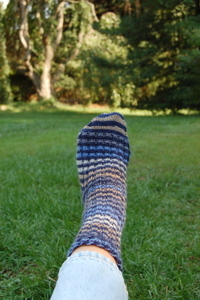 I managed a few rounds of sock #2 during the half time of Nine’s game. Couldn’t knit and watch yet, especially while she was in goal first half. Eleven, by the way, is still cranking out bibs and burp cloths (she knit right through both Nine’s and Six’s games), and we’ll be posting them on the Mason Dixon KAL soon. 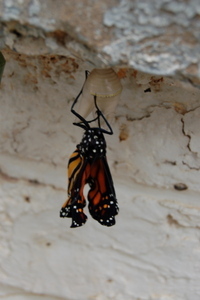 And, while we were out, another monarch came into the world. Reminded, yet again, that I am not the boss around here. 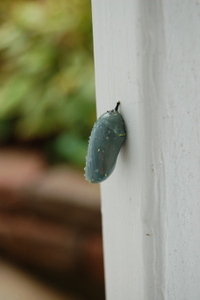 The very first chrysalis we spotted, the one on the porch railing, opened Friday morning – while I was at the grocery store. We expected it yesterday – the dark butterfly colors had been showing through more and more all Thursday afternoon – but it was still there in the morning when the kids left for school. I figured I’d do a quick shop, and be back, ready to shoot the very moment the butterfly emerged… obviously not. 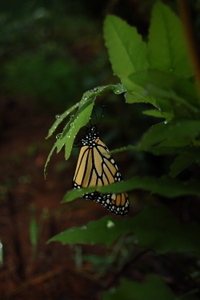 Even so, at this point, it feels like I’ve taken more pictures of the monarch butterflies in the last two weeks than I did of Six when he was a baby. Some of that’s because of shooting digital, but still… You know what I mean, if you’ve raised more than one child – or if you were anything other than a first born yourself: the rate of documentation decreases steeply with each child. A friend of mine is keeping track of her third son’s first year on index cards. She carries a stack of blank ones with her, and whenever he does something she wants to remember, she jots it down on a card. The cards are gathering in a shoebox at their home – and maybe someday, she thinks, might morph into a baby book. Or not: if you ask me, the format tells as much of the story as the content, in this case. 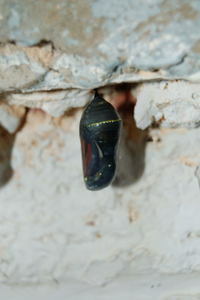 One more chrysalis that we know about; two caterpillars still feeding. I know they’re growing on their own schedules; I’m just having a hard time acting like I believe it. 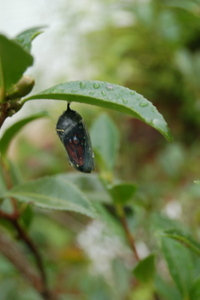 Wednesday, around lunchtime, I noticed a split in the chrysalis that looked due to open. 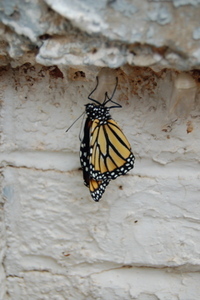 After Tuesday’s near miss, I figured I’d hang out for a while and see if I could catch this butterfly actually emerging. I got my camera, took a few pictures, and then sat down to wait. It was kind of drizzling and my toes were getting cold; in the end, I lasted as long as it took me to skim through This Old House. I took a few more pictures, relocated a very small but very persistent spider one last time, and went back inside. While I wasn’t watching, out she came. It rained hard last night; I worried a bit; in the morning, she was still close to what had been home. 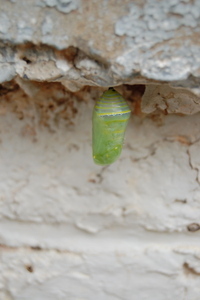 I sent the kids off to school Tuesday with the thought that it would probably be too cool and overcast for any monarchs to hatch – but when I went to check, one of the two chrysalises under the front porch, nestled in a sun trap of stone and brick, had become quite dark, butterfly colors showing through, the sign that it was nearly there. Staying and waiting and watching for it to emerge would suit me fine: I’d sit down on the retaining wall beside the porch foundation where the chrysalises are hanging, looking up occasionally from my knitting; it’s a mystery how long I’d have to be there, but that would be the surest bet I would be there when something happens. Or even if I were out in the garden, working nearby, I could be popping over to check. I’m indoors for the morning, though, paying a bit of overdue attention to inside work after so much time outdoors getting the garden ready for last Saturday. But with the front window wide open and the screen slid up, if I lean out all the way, I can just see what’s going on under the porch. 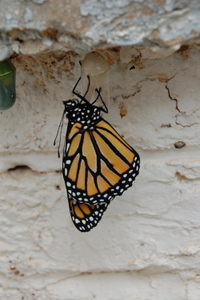 In the end, I just missed seeing the monarch break out of its chrysalis, but only by a little bit: its wings were still wet and crumpled when I took the first picture, around 1:30 Tuesday afternoon. 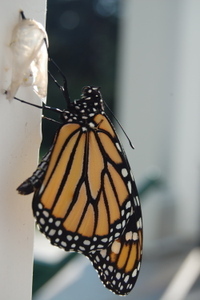 By 5:00 his wings were flight-worthy enough to flutter away from the spot where he’d been since Friday a week ago; by 6:30 he was gone, joined up (I hope) with the other half-dozen monarch butterflies that have been hanging around the garden the past few days. We’ll start the watch over again in the morning, for his former neighbor. Finally got to pick up a bit of knitting Saturday night, and Domino Knitting has already paid for itself. A whole other set of loose ends, conquered. Look: knitted in ends on the wrong side of Nine’s Not a Rug Anymore Vest. And I swatched the brown needlepoint wool for the Afghans for Afghans vest; got gauge on the second try, with size 7 Denise’s. It was pretty nice to work with, and seems to be a close match in weight to some left over wool from last winter (ball bands long gone), so we have stripes available. A black swallowtail. We had caterpillars of these feeding on fennel in two different parts of the garden earlier this summer (there’s a picture here) but never saw chrysalises. Nine spotted this butterfly on the front walk Sunday afternoon, right next to the stone wall that runs behind the border. 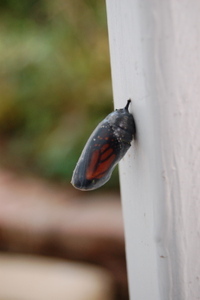 I nudged it up onto my finger to move it to a butterfly bush right nearby, and discovered that its wings were still a bit wobbly – a very, very new butterfly. 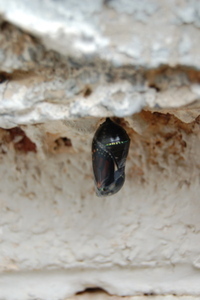 The pupa must have been hidden in or on the wall. 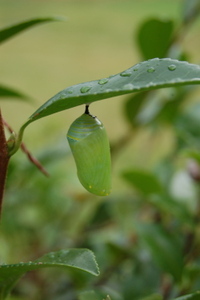 And one of the monarchs has snuck off without our noticing; we found a smudge on the underside of a leaf where one of the chrysalises used to be. 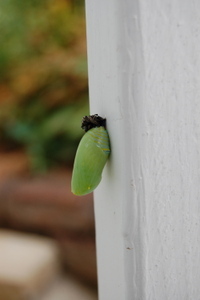 Its former neighbor (the one we watched pupate) is still there, but more of the pattern and color of an adult butterfly is showing through its shell; same for the other three I’m watching. Soon, very soon. ... I'll give you shelter from the storm. These two are riding out Ernesto's rain just fine. Welcome to everyone who’s here to check on the caterpillar ranch. I promise I’ll keep the updates coming regularly, and even if it means almost missing the school bus like we did when we were watching the pupas slough their caterpillar skins, I’m hoping to catch photos of the butterflies emerging, which could begin sometime around the second weekend in September. Please stick around for the knitting and the gardening, as well as the books and the laundry, which I get around to (in real life) less often and more often than I’d wish (respectively; not enough reading, too much laundry.) And don’t worry, butterfly fans: the garden has plenty of nectar sources for the adults to feed on once they emerge. 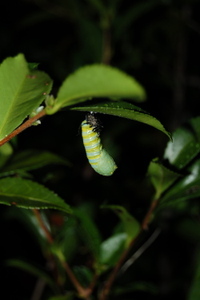 We were out in the front garden last night after supper, running around and checking on the caterpillars, when I noticed one decidedly out of place, parked far away from the food, on the porch railing. “Silly thing,” I thought, “let’s get you out of here and back at the buffet where you belong.” I went off to find a suitable leaf to scoop it up, planning to reunite it with its siblings who were still plowing through the food supply as relentlessly as, I’m told, teenage boys can. The caterpillar didn’t move in the moment I was gone: it was still there, still as death. Exactly. Stuck there, with a tiny white blob of something gluing it upside down to the wood. It wasn’t moving because it was on the brink of moving on, done with this caterpillar business, and ready for something else. The caterpillar twisted and squirmed as it shucked itself out of its old skin. 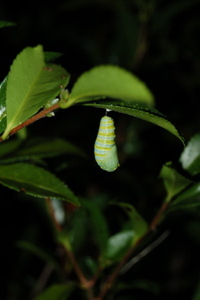 And it didn’t take long for the new pupa – which was still fairly fat and soft and grub-like when it first emerged -- to shrink itself up into a hard shell (can you see how the orange stripes condensed?) to wait for what’s next. 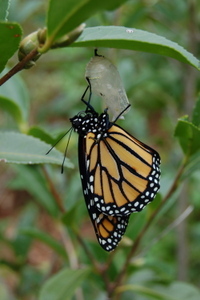 Monarch Watch says 10 to 14 days. We’ll be waiting, too. Postscript: the butterflies have arrived! Follow the whole story here. The clock is ticking on the garden’s open day deadline. In my dreams I see calendar pages shuffling off into the air, Hollywood style, like the leaves that are falling from the weeping cherry tree too soon because it’s so, so dry. The soil in places is like powder; young trees are wilting, and I can’t drag the hoses around fast enough. I will not want to open the water bill when it comes next month. But Sunday afternoon, I was out weeding, working right by the front door. A friend who will be helping out on the open day would be dropping off her daughter to baby sit in a few hours. I didn’t want her to be losing sleep over the state of the place (that’s my job) so I thought I’d spiff up the beds on either side of the front walk. Now I’m pretty sure those are monarchs, but they can’t be, I think, because this is bindweed, the weed I was planning to pull, and the monarchs only eat milkweed. Nine comes over and takes a look. She thinks they’re monarchs, too. Time for little research: monarch + larvae + bindweed -- and boom: Monarch Watch gives me blue vine, Cynanchum laeve, which, though often mistaken for bindweed, is a milkweed (though not an Asclepias, which are the milkweeds I know) and a great late season food source for monarch larvae. Back out to the garden, and here I am having a little paradigm shift right there by my front porch. Well of course, it’s a milkweed; that explains the bright orange yellow aphids, and look, there’s the cluster of white flowers just like the photo, and oh my: look at all of the caterpillars. Six comes on over, considers the situation, and announces “We’ve got a caterpillar farm!” – and it’s him, out of all of us, who spots (even before he goes back inside to get his cowboy/rancher hat) the tiniest ones of all. 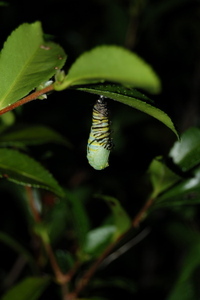 We count nearly twenty monarch larvae, grazing away on the leaves. Checking on our fattening herd this morning, I discover the lovely little things are doing my weeding for me. Counting down the days until the garden’s open, I’m fighting the urge to be conventionally presentable, remembering overheard chatter a few years ago during a Garden Conservancy open day at a truly great local garden, which the chatterers found “kinda weedy.” I keep reminding myself that one visitor’s “weedy” is somebody else’s “habitat,” and that’s part of what this garden is about: lots of things live here, not only us; some times I just let things be, gardening by benign neglect. So, caterpillars: Eat up guys and girls, and then how about if you all go off and transform yourselves into lovely butterflies and let me mop up your leftovers in, say, about a week and a half. Can we do that? Do we have a deal? Postscript: As of 6:00 pm Monday, it’s raining, gloriously raining.